I had a lovely day in Birmingham a little while ago when I met Naomi from the Facebook Stashbusting group. She really wanted to see the pattern for Vogue 1258 which is now out of print but has become very popular. Naomi intended to draw the pattern out herself but by seeing the original was able to get a much better idea of how this dress went together. Since we were there it seemed rude not to go look at the fabric, wouldn’t you agree? Anyway, despite both being ‘stashbusters’ we both came away with more fabric. I bought the extra ‘penguin fabric I needed to make The Managements shirt, some striped green single knit jersey (not sure of the fibre composition), and some grey jersey with some stitch detail that makes ‘waves’ over the width of the fabric. I didn’t intend to buy any fabric (again) but this just whispered ‘Style Arc Toni’ from knee level and I had to buy it. Do you agree? I think it is perfect for a Toni. Anyway, I have been pretty busy with other stuff and had little time to sew for myself but The Managements shirt is finished and declared a winner. He hasn’t tried it on yet but since the pattern is now looking a little shabby through the use it has had I know it will fit just fine. I have a project for me on the table, all ready to go in the morning. I’m not going to tell you what it is yet but can you guess from this teaser picture? I have been having quite a nice time around clients doing stuff for me – and him. I am doing my absolute utmost to sew from stash – including all the odds and sods needed to complete – so when I manage that I’m very happy. The Management is very tolerant of my fabric habit so he does deserve some reward occasionally. I decided that I would get stuck in on the fabric I bought to make shirts for him. 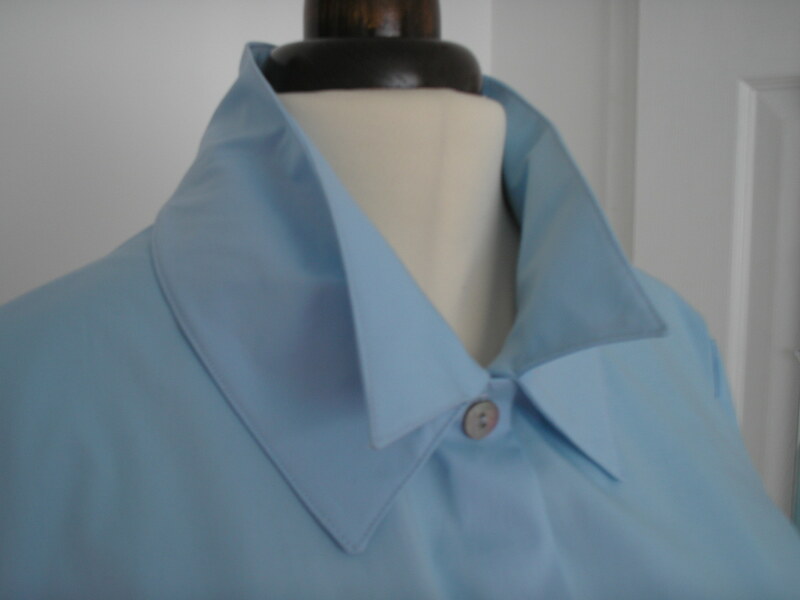 It’s actually very easy as he prefers to wear short sleeved shirts so no problems with plackets and cuffs – even the collar is pretty easy since these are ‘soft’ dressmaker shirts rather than having a really stiff collar. Striped cotton shirt – he seems happy! I got the lovely penguin fabric out as I really wanted to start with that – and *damn it* there wasn’t enough! I hadn’t checked the width when I bought it and it isn’t the 150cm wide I assumed it was. Pants. I will try to buy another 1/2 meter next time I’m inn Birmingham which will solve the problem (or make something for me….). After that I was a bit huffed but decided to plough on with the stripe. It had been pre washed and was ready to go and there was loads of this as I had thought it would be good as pj’s but he preferred the idea of it as a shirt. The pattern is self drafted (but is similar to McCalls 6044) and has been made so many times I know I can just cut and go so it is a really nice easy garment to make. He seemed pretty happy with it – and the penguins will be next. The next item from stash has been a bit out of season – but I really wanted to try the pattern and make up this fabric. It is the leopard knit from the last trip to Birmingham – the one where I wasn’t going to buy anything, remember? I would blame Fairy but I really didn’t need any encouragement. My original intention for this fabric was the twisted jumper from Pattern Magic but I really wanted to make Fadanistas sneaky shrug. I loved the shape, and that it could be worn either way up (honest, make it and give it a try! 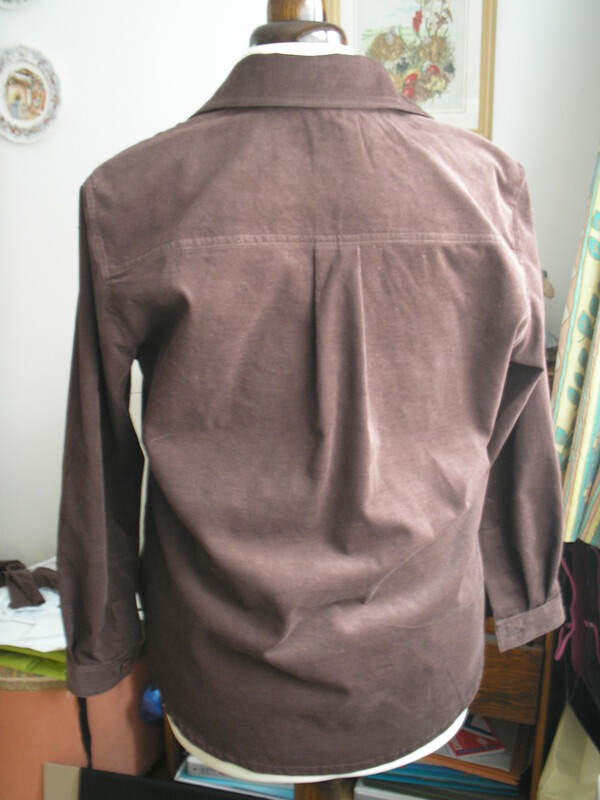 ), even inside out if you take the time to neaten the sleeve hem. This shrug is pattern gold – and Sue has given not only the pattern dimensions but also a tutorial on her blog. It looks a bit complicated at first but the trick is not to over think it. It took about an hour to cut out and sew. Sadly it is too warm again to model it (what is it with British weather?) so I have asked the lovely Bessie to show it off. I know I am going to wear this loads – and the bonus is that there is almost certainly enough fabric left to still make up the twisted jumper. Score! So, the shirt used up 1.5m, and the shrug 1.8m so 3.3m used – only a couple of hundred meters to use up! In my last post I gave a little teaser picture of something I had been working on as a gift. It was a shirt my daughter asked for – and although that was a while ago I thought it would be nice to sneak it in with her birthday gift. I used the pattern number 101 from February’s Burda magazine. I found this one to be a very easy make. I worked a placket on the sleeve opening rather than just binding a split , and shortened the body and sleeves as my daughter is very petite, but made everything else as is. 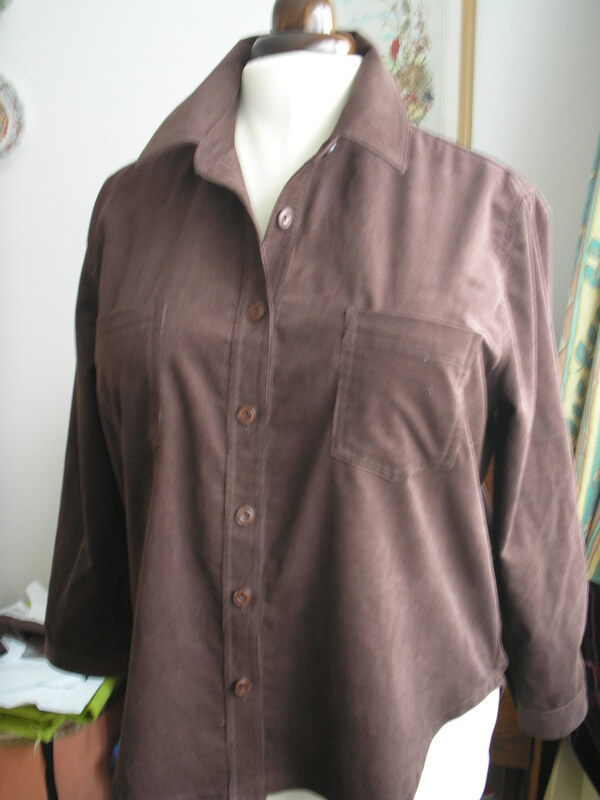 I’m afraid I can’t comment on the method that Burda give as I didn’t use it – I have made so many shirts/blouses over the years I have stopped looking. The fabric is a wonderful soft baby-cord from stock (still some left!) in a gorgeous chocolate brown. I was desperate to get this wrapped and into the post so the pictures aren’t very good – and Bessie is a little too large to be modeling this really. I hope to get a photograph from J when she gets a chance so I will update the post then. If this fits her reasonably well there is an adaption in the magazine to make this into a jacket which I rather like. If my daughter agrees I may make that for her too. Hmmm. I really hadn’t expected to take so long before I was able to show you my Pattern Magic shirt with the special collar. I have no excuses – I have just been unreasonably slow. But here it is! This was my first attempt at anything using the Bunka block drawn out on my course at Morley College. This block was made using three (yes, three) measurements from my body. Bust, waist and back length. That’s all. Winnie Aldrich uses nine measures for her bodice block which I still had to adjust significantly. I confess I had little faith in this Bunka block being remotely close with only three points of reference – and also I am hardly a typical ‘Japanese’ figure. So prepare to be amazed. IT FITS! I made few alterations to the body – the dart into the armhole was left there, I lengthened the body to hip to allow tucking, and I put a little shaping into the back so I wasn’t entirely shapeless. I can’t quite believe that it has worked so well – I would only want to narrow the shoulders a tiny bit if I when I use this again. I will also use a bit of seaming to lose the darts and add a bit more waist shaping. Other than that this is a winner. The fabric is cotton with a little elastane which came from stash. It has lurked for a while as I was unsure of the colour – almost exactly the colour of Blu-Tack. There was already a matching thread in my stock, and even more amazingly I had enough abalone shell buttons in the right shade and size to complete the job. Who would have believed it – I didn’t need to buy anything for this project! Collar with two expressions – detail. When I make this style again I will slightly reduce the size of the lower collar section as it is a bit big (It makes me think Travolta in Saturday Night Fever). The main collar section that sits over the top has to be a little bit larger than the two underpieces or it pulls a bit. 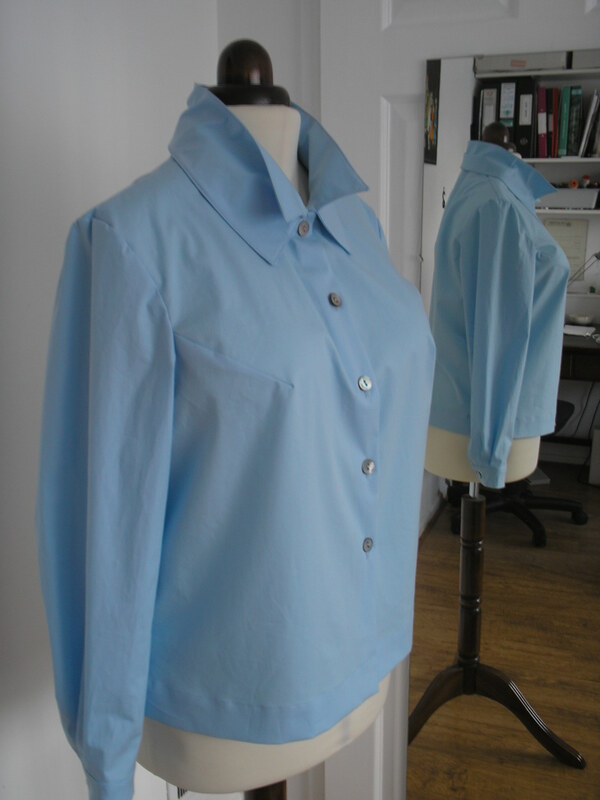 I did use all the drafts from the pattern magic book but in all honesty it would probably have been a lot easier to just draft the collar to fit a tried and tested blouse/shirt pattern. I know that without the time at Morley I would still just be stroking and admiring these books but I can see them getting out more now. I did struggle a bit to use their instructions for the sleeve block so when I work out the best way to explain what I did I will post. That doesn’t mean it is necessarily the ‘right’ way of doing the sleeve but it worked for me. Hopefully it will take less time than this post! I am calling this SAM8 – and drawing a line under the SAM2012 as I think I have taken long enough. It would be embarrassing to still be finishing these after January. Still four short but since I am a glass half full sort of gal -Hey! I made eight shirts last year! The management requested another ‘fun’ shirt a little while ago. Not one to disappoint I decided that it would be a good project as part of his Christmas gift. As you might have predicted, a last minute panic ensued and one of these ended up as an IOU under the tree as it was still in pieces. The self drafted pattern was already made so there were no fitting problems or other obstacles to prevent this being a really easy project. So…, to make the project more interesting to me I decided to make one of them entirely on the new to me 1945 hand cranked Singer (Molly). One made on the ‘all singing, all dancing computerised Pfaff – and one VERY old school. Can you tell which is which? You want more detail, huh? Have a guess and I will say which the Pfaff and which Molly constructed in the next post. I really enjoyed the process of making these – it is so easy to just rush headlong at something you have made before and this made me really slow down. That might have been irritating to some people but I found the repetitive movement really relaxing and almost meditative. The management came in whilst I was making the second shirt (on Molly) and is now convinced sewing is dead easy – ‘You just go like that (make hand cranking motion) until it’s done’. Thank you dear. Now that they are finished they count as shirts 6 & 7 in this years SAM. Clearly I am not going to be able to finish this challenge since it is December 31st now. All that is left for me to say is Thank you to all of you who have followed my blog, and made a comment or two, throughout the last year. I wish you all (and all the other sewers in the community) a Happy, Healthy, and Wadder Free 2013. Well I really hope everyone has had a happy Christmas! Here, chez Hood, the mood has been a little mixed. The central heating broke down on Sunday. It was fortunately repaired on Christmas Eve – just before I went to the dentist who confirmed that I had a stonking great dental abscess. Happy times. Lots of antibiotics and no alcohol. My darling daughter was home for a couple of days so I was able to finish the blouse I mentioned in a previous post and have her model for you to see. The blouse was very straightforward to make – as I don’t read Spanish I can’t comment on the instructions from the magazine. I did change the front slightly and cut both centre front sections as one piece – I didn’t want to risk a break in the stripes running down centre front. I think I would also close the dart in the side front in any future incarnations of this that I might make. I really can’t think why I didn’t do it this time as I usually try to ‘lose’ any darts into seams where possible. I had to take the waist in a bit as my running DD is very slender. If she wasn’t so nice I could get cross. As you can see, the daughter is happy with the shirt – there are a couple of issues I would change next time but it is still probably a better fit than ready made. There is another piece of fabric waiting to be made into this pattern but until I feel better (or it promises to stop wriggling every time I go near it!) it will have to wait. The great thing is that this moves my Shirt a Month up to FIVE! And we are only in December which is month….er….. However, I do have something else to show you very soon which might just change that again. In the meantime I hope you all had a great time in the holidays and are looking forward to New Year. When I will still be on antibiotics and alcohol free! (Do feel free to suggest good alcohol drinks for me to enjoy on New year – I am bored with what I have now). Old Singer – Happy Hoody! Oh boy, am I a happy bunny! I have been looking out on ebay and such for a hand crank Singer sewing machine for a little while. I can’t really explain why I really wanted one so much but I know that other bloggers have raved about their old machines (which oddly seem to be capable of so much more than we expect) and the Singer buttonhole attachments that go with them. I also learned to sew on an ancient Black and Gold Singer – though that one was electric. I managed to get a buttonhole attachment on ebay but lost out on the machine in the last seconds. Grrr. Back to scouring the interweb. Well… I got one! And isn’t she a beauty! From the serial number I have discovered that this machine was built in Scotland in 1945. Despite the age the machine is in very good condition, even if the wooden veneer on the base is a little the worse for wear. I can handle that. I didn’t expect to find the accessories box still to have feet in it, and a selection of vintage Singer machine needles (still in their paper packets). For some reason the management decided it should be called Molly – hence ‘she’. I collected the machine on Sunday and managed to attach the buttonhole attachment to it on Monday. What fun trying that out! Even with my computerised Pfaff machine (which is the one I use most) there is a little variation in the buttonholes made. Given that this is a straight stitch machine , built in 1945, and an attachment that hasn’t been used in donkeys years it gave surprisingly good results. This is an attachment that doesn’t have ‘cams’ and the adjustment is still a bit of a mystery to me but I suspect that once set up this will be well used. I would probably still like to get one of the attachments with the cams that make keyhole buttonholes – they look so nice on jeans and jackets. I may try this out for the buttonholes on the blouse I am making for my daughter (which is coming on fairly well – photographs later) as I really want to use it on a ‘real’ project. P.S. Still in the local pub for their WiFi – no solution from my ISP so I shall be moving soon. Hopefully I will then be able to post without having to buy a coffee! (I know – I should have a decent drink since I am here).